This Is Your Captain Speaking: So How Do Jet Engines Work and Why Would One Blow Up? 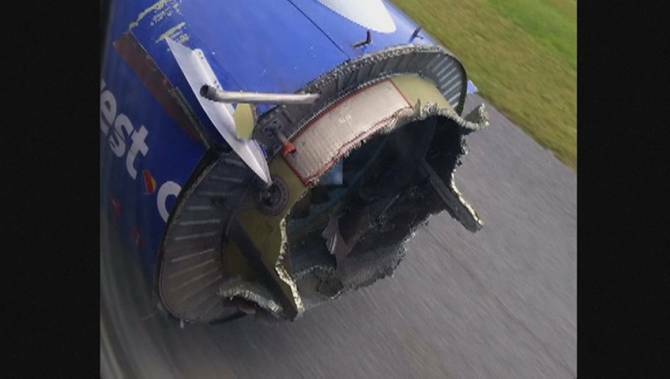 This past week a Southwest Airlines 737 suffered a very dramatic engine failure while on a flight from New Orleans to Orlando. It appeared as if the entire front of the engine came off judging from pictures taken from inside the cabin. The aircraft also suffered a rapid decompression which was most likely due to debris from the engine striking and puncturing a hole in the fuselage. Considering that the time of useful consciousness (TUC) at 31,000 feet is only one to two minutes, the crew did an outstanding job of prioritizing their emergency action responses and safely recovering the aircraft into Pensacola. On September 8th last year a British Airways 777 aborted its takeoff from Las Vegas after its left engine failed and burst into flames. The entire left side of the aircraft was engulfed in flames by the time emergency responders were able to put the fire out. Again, thankfully, no one was injured. The aircraft was later repaired and returned to service. So in these two high profile incidents, jet engine failures caused very dramatic and potentially life threatening damage to commercial airline flights. But how do jet engines work in the first place and what would make one blow up? Is there any way to make engines safer or are these types of mechanical failures just something with which we'll have to learn to live? Modern turbine aircraft engines are simultaneously simple in operation, yet highly complex precision machines. Their operation, which can be simplified into the title of this paragraph, consists of four elements. Air is first drawn into the front of the engine and is next compressed by a series of blades rotating on a center spool. This compressed air is then combined with fuel sprayed into the combustion chamber and ignited. The resulting flow of hot expanding gas flows over turbine blades also connected to the center spool and then exits at high speed providing thrust. The turbine blades provide power for the compressor blades and the process repeats. The earliest jet engines were known as "pure turbine" engines where all the air from the inlet went through the hot section. Since then, large fans have been employed where only some of the air goes into the hot section but most of the thrust is created by the fan and bypassed around the core of the engine. High bypass engines are now the standard on airliners though pure turbines are still used on military aircraft. And that's it. Conceptually quite simple and very few moving parts. The truth is that because jet engines have so few moving parts in comparison to other types of engines, there is very little actually to go wrong. The problem is that when things on a jet engine do go south, they can make a big mess as seen in the two above mentioned incidents. As far as the central operation of the compressor-turbine assembly is concerned, metal fatigue and subsequent failure are the primary culprits. Investigation of the BA 777 incident revealed that the spool in the high pressure section of the compressor had failed and parts of the compressor spool and blades were subsequently thrown through the engine case and cowling. A similar metal failure was implicated in the crash of United 232 back in 1989 which claimed 111 lives. Thankfully, advanced metallurgy and inspection technologies make these types of problems quite rare. While the operating principles of jet engines are simple, many of the technologies used to make them work are quite complex. The metallurgy used in building the fan and compressor blades is state of the art. These structures are mostly made of titanium which while being extremely strong and flexible is notoriously difficult to cast. Titanium castings are required to be forged in a vacuum as any air can induce impurities resulting in cracks in the metal. Newer technology engines now use composite materials in fan blade construction while retaining titanium for the leading edges of the blades. The tolerances required inside the fan and compressors of jet engines are extremely fine. Modern jet engines even have what is known as an ablative coating around the primary fan which is designed to wear away as the fan blades expand through heating. This keeps the gap between the fan and its housing as small as possible for efficiency. As you might imagine, any solid object which is ingested by a jet engine can cause havoc. Any damage to the compressor section of a modern jet engine can cause what is known as a compressor stall which is a major disruption in airflow. When the airflow is disrupted, the fire can go out or be severely restricted. This is how Sully and his passengers ended up in the Hudson river courtesy of a flock of Canadian geese. I should add a note about all the auxiliary components that, while not central to the operation of a jet engine, are attached to the engine in what is known as an accessory drive unit. It is located either beneath or on the side of the engine yet inside the cowling. Things like hydraulic pumps for the flight controls, generators, and fuel control units are driven through a drive shaft powered by the main turbine. Problems with these components may or may not result in engine failure depending on the affected component and the nature of the failure. Modern turbine engines are models of efficiency and simplicity. They are highly reliable power plants and yet, like any machine, subject to occasional failure. That they fail so infrequently given the extreme conditions in which they operate is a testament to their design and upkeep. aircraft assembly jobs-View Aircraft Assembly jobs in Houston from employers who want to hire YOU. Find your perfect job & apply. assemblyjobs.com - a better job search experience.aircraft is a challenging job and requires a firm educational background. Are these engine failures all leap engines? No. None of them were Leap engines. Leap engines are equipped with composite fan blades. For over 20 years composite blades (much larger) have been powering the GE90s (777) and Genx (787 & 747).